Assistant coach Rick Tocchet gives his three impressions from the bench of the Pens’ 5-3 win against Columbus. 1. It was a good team effort. A lot of people contributed on the ice, on the scoresheet, a little bit of everything. 2. The power play getting three goals was nice to see. 3. Discipline. That’s something we’ve been preaching. When things were getting hairy we kept our composure and stayed with it. Michelle Crechiolo gives her three impressions from the press box. 1. 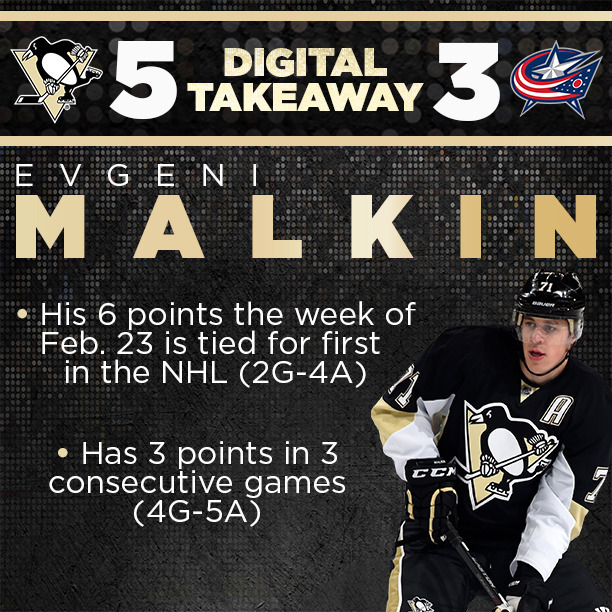 After scoring one goal in each of their last three games, the Pens’ power play exploded for a trio tonight. It was like a slow burn erupting into a boil. It came through and took over in the second period when the Pens needed it most. Early in the second the Pens had a lengthy 5-on-3 advantage, and they capitalized on both penalties before scoring another later in the frame. The biggest reason for their success was movement with both the puck and bodies. And even though they gave up their second shorthanded tally in as many games against the Jackets, overall Pittsburgh’s power play was the reason they won the game. 2. Today was a perfect example of what happens when you stop trying to be so fancy and just get pucks to the net with bodies there. It all started with the Pens’ first goal, when Evgeni Malkin, after dancing around the entire offensive zone, threw what appeared to be a harmless backhander to the net after running out of options and it squeaked through Jackets goalie Curtis McElhinney and the post. David Perron continued the trend when his pass from the side of the net banked perfectly off Jackets defenseman Jack Johnson going down for the block and into the net, and it kept going from there. McElhinney played in Columbus’s game last night, and appeared to get more tired as the game went on. The Pens took advantage of it. "He played in Washington and we decided with our schedule, we decided today that we’d give him a few more days. We were going to give him some extra time and it gives him a few more days before we head out on a real tough road swing with a lot of games. It gave us a chance, with the schedule, to give him another day. So we made that decision today." When asked if Ehrhoff was having more concussion issues, Johnston replied, "No, it’s more of the protocol of what we were following from last week. I was surprised he was ready for the Wednesday game. He said he was ready and we put him in. Otherwise he was only going to be playing one game before the road trip anyway."